A thank you letter for a job offer has one of two outcomes: the candidate will accept the job or the candidate will reject the job. Either way, thank you letters for job offers tend to be brief and business-like communications though they should not be considered form letters. As business letters, thank you letters for job offers should be neatly typed and posted, even if the candidate has given his or her acceptance or rejection of the position through more informal means (over the phone, via email, etc.) already. Sending thank you letters for job offers serve two purposes. First, they allow candidates to acknowledge receipt of the job offer. 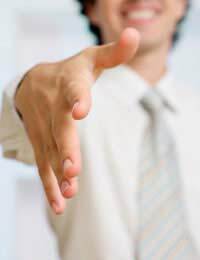 Second, they allow candidates to accept or reject the job offer. Thank you letters are not the place to negotiate the terms and conditions of employment, so they tend to be short and to the point. If a candidate is unsure of the terms and conditions attached with a job offer, (s)he should contact the organisation directly and find out the details before putting his or her answer in writing. When these thank you letters are sent via email they do not necessarily need to include the candidate's contact information. However, even if a quick email is sent immediately a more formal thank you letter should be sent via the post soon after. These hard copies should be formatted as formal business letters with the candidate's contact information present, and a copy of such letters should always be kept by the candidate for his or her files. Copies of the job offer, contract and any supporting documentation should also be kept in the candidate's files for future reference. It is with great delight that I accept your offer of the position of Fund Administrator with XYZ Corporation. As previously agreed, I will commence work on 15 November and have the relevant paperwork returned to your office no later than 1 November. I look forward to working as a part of your team and contributing to XYZ Corporation's stellar reputation. Thank you for your offer of the position of Fund Administrator with XYZ Corporation. Though it was a hard decision to make, I have accepted a position with another company and therefore can not become part of the XYZ Corporation team at this time. I'd like to thank you again for the time you took to interview me and share details of this position and XYZ Corporation. I hope that our paths with cross again in the future. If you did take the job why not have a read through our article Thank You Letter and Resignation and how about Thank You Letter to Colleagues on Last Day of Work. How do i say thank you to the new Managers, giving me the opportunity as a receptionist in a letter? Your web pages are cute and concise. I am much aided! These are great examples, brief and to the point. As you say, there's no need to go into job conditions or contract in a letter like this, as those require other negotiations. Politeness, whether accepting or rejecting and offer, is paramount. You might end up applying to the company you've rejected in the future, and politeness will be fondly remembered. Always better to part on good terms. Thanks a lot for the very good examples of letters.